After obtaining degrees in English Literature and English Secondary Education, Sean Lords packed up his bags and went to Seoul, South Korea where he lived for three years teaching English abroad. Sean has since returned to the States and is currently at work on his Master's degree. Gearing up for a year of teaching abroad can be an exciting time. Your future is about to radically change. Everything that is familiar and comfortable is about to get flipped on its head as the day to your departure grows nearer and nearer. But before you can pack your bags and head off to the airport, there are a number of preliminary steps that must be in place beforehand. From securing a passport to having an approved visa, you will definitely want to allot an ample amount of time to make sure all of your ducks in a row. For most, the need to take and pass a TEFL course is another part of the planning process for overseas teaching. The TEFL is a certificate that shows you have successfully completed a course on English language instruction and possess the necessary skills to teach others the intricacies of the language. Below are some great tips and facts to consider when preparing your TEFL course. 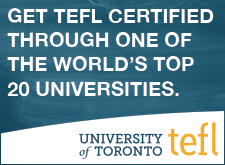 The first thing to look for when considering what TEFL course to choose from is what sort of accreditation they hold. How long has this institution been around? While the process of creating a TEFL certified school is by no means easy, it is not as regulated as other forms of education. This unfortunately means that schools that offer drastic price differences than others and boast the majority of their classroom time as, “online hours” are generally not going to equip you with the proper tools that a more accredited course would. While more classroom time can seem like a burden, the truth is the more teacher and peer contact time you have, the better honed you skills will become and consequently your performance as an ESL teacher will increase. The next thing to look for in a TEFL course is what sort of job placement opportunities/success rates the institution has. If a course offers no placement services, you might want to turn your attention elsewhere. TEFL job placement services are a valuable commodity. They have the potential to open you up to teaching locations and jobs that you were previously unaware of. In the same sense, inquire about their job placement success. How many of their graduates found work soon after they completed the course? Generally, most TEFL courses will have some data showing these numbers. The internet is your best friend when it comes to deciding on a TEFL course. If you have narrowed your choices down to a few course givers, go online and see what others are saying about their experiences there. User reviews can be a good way to judge the quality of a course. Keep in mind that reviews of this nature generally tend to be polarized in one direction or the other. You will usually find glowing praise or biting criticism, so take each statement with a grain of salt. However, if there is an excess of negative reviews, perhaps it will be in your best interest to look into another establishment. A TEFL course is made up of about 120 hours of instruction. Depending on the company you go through, this can be broken into classroom/instruction and online hours. As stated before, try to avoid a course with a heavy dose of online hours. While you will still learn the necessary skills to be an effective teacher, you will be robbing yourself of classroom interaction and teacher contact time. The culmination of your TEFL course will see you giving a mock lesson in front of your class. For some, this can be quite nerve wracking as the conclusion of your lesson is turned into a critique sessions with the rest of your classmates telling you what they enjoyed and what could be improved upon. Remember, everyone is in the same boat here so don’t get too worried about this portion of the class. Not to mention a class of peers will generally be better behaved than your upcoming class of 15 rambunctious 12-year-olds. Once you have completed your course, it’s all about marketing yourself. Take another look at your resume. What can you add and take away now that you have taken your TEFL course? Remember, you are applying for a job overseas where most likely, the individual reading your resume will not have English as the 1st language. Putting on your year stint as a barista for Starbucks may show steady employment to the average employer but to the interviewer of an ESL school it may appear irrelevant and fall out of the scope of what they are looking for. Rather than hurt your chances at employment, capitalize on the lesson planning skills you learned, the extensive amount of classroom hours you have had or perhaps your creativity in lesson planning. Generally, anything centered around education and instruction are going to make you stand out the most. Have you or someone you know recently completed a TEFL course and have a few gems to share? I’d love to hear your thoughts below.